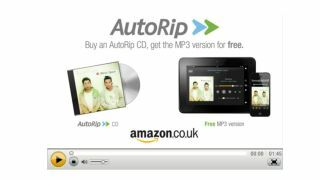 Amazon's AutoRip service, letting you download free MP3 versions of CDs, Vinyls and casettes you've bought from the site, is now available to UK users. The service is free - the only caveat being that the album has to be "AutoRip-eligible" - meaning you can grab 256 Kbps MP3s of records purchased over the past 14 years for no extra cost. Amazon has landed deals with major labels to make over 350,000 albums available to customers. The service hit the US in January this year and has unsurprisingly been pretty popular, with AutoRip-eligable CDs selling particularly fast. Other than being able to pair your past purchases with free MP3 versions, there are other benefits here too, such as being able to download an album you've decided to buy on vinyl before the record arrives. To use the service, you merely have to open the AutoRip player and click on the "Purchased" tab to see what you can download from your previous purchases. The move sees Amazon upping its game in the battle of music sales, turning itself into a one-stop shop. It will certainly be hard for others to compete with this.